Anne Stausboll, who retires from CalPERS at the end of 2016, is urging global capital markets to remove barriers so the aggressive climate change goals agreed to by 175 global leaders in Paris can be achieved. “The Paris agreement’s importance cannot be overstated. It’s unleased an unprecedented opportunity for institutional investors worldwide – a powerful, global green light to shape tomorrows low-carbon economy,” said Stausboll, speaking at the annual Ceres conference in Boston. Stausboll is chairwoman of the sustainable investment advocacy organization’s board. Dubbed the $300 billion woman for the value of CalPERS assets under management, Stausboll appears to be spending much of her remaining time at the pension fund advocating for mandatory reporting by companies on the topic of climate risk. 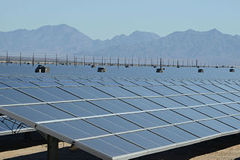 CalPERS recently invested in two large solar energy projects in southern California but remains concerned about 80 companies that contribute half of the greenhouse gas emissions of the 10,000 firms in the fund’s portfolio, Stausboll said. The fund is backing proxy campaigns aimed at spurring more climate risk reporting at three global mining companies and 12 U.S. energy producers, she added. Beyond the proxy battles aimed at specific companies, Stausboll pointed to public policy challenges facing nations, states and local municipalities over carbon pricing, the elimination of fossil fuel subsidies and incentives for clean energy that must occur to achieve the COP21 objectives. Corporate governance also plays a part in Stausboll’s agenda. Working with New York City funds, CalPERS is pushing for “climate competence” on corporate boards.